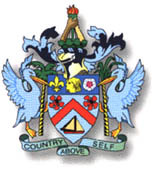 The Island's motto is "Country above self". Principal Exports are sugar, beer, lobster, electrical equipment, margarine. The centre of the coat of arms is dominated by a shield at the base of which is a lighter in full sail. A red chevron is highlighted by two Poinciana flowers. At the top of the shield is the head of a Carib, supported by the fleur-de-lis and a rose. These symbols represent the early inhabitants of the islands, and the influences of the French and English. The national flag of St. Kitts & Nevis features green for our fertile lands, yellow for our year-round sunshine, black for our African heritage, and red for our struggle from slavery through colonialism to independence. It also displays two white stars on a black diagonal bar, symbols of hope and liberty. The national flower is the Poinciana or flamboyant, named after Monsieur de Poincy, the first French Governor of St. Kitts, who is said to have introduced it to the region. Its scientific name is Delonix Regia and it is said to have originated in Madagascar. The flamboyant is one of the most striking trees of the tropics, with its umbrella-shaped crown and its compound deciduous leaves, and red and yellow scalloped flowers followed by long, black seedpods. It blooms from May to August. The national bird is the brown pelican, Pelecanus Occidentalis. Young pelicans are brown on the head, neck and upper parts of the body, and mostly white below. On reaching maturity, the majority of the body becomes dark brown while the upper part of the head turns white. During the postnuptial moult the adult's neck turns white. The neck and head are not extended during flight. Brown pelicans are sometimes solitary feeders but may also be found in small flocks as they feed on schools of fish near the surface of the sea. They can be found throughout the West Indies and in the sub-tropic regions of the Americas. They nest in colonies along the coast in low trees and in bushes.